The UK's Royal Mint began their series of lunar calendar coins in 2014, with the Year of the Horse. 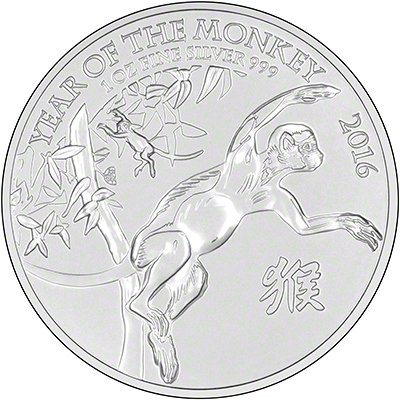 The Year of the Monkey is the third coin in the series, and the ninth in the lunar cycle. We received our first delivery on 1st October, 2015. The Perth Mint already have a lunar coin series which is incredibly popular. The bullion silver coins have a limited mintage figure of 138,888 coins. This number was chosen as the number 8 is thought to be particularly lucky in Chinese culture. The Royal Mint sold out of their trade allocation before the coins were even released. This means that once we have sold out of our supply we are unable to source any more. The reverse of the coin was designed by the British artist, Wuon-Gean Ho, who has designed all coins in the series to date. Taking inspiration from her Chinese and British descent, the coin features a playful monkey on the reverse. It is meant to symbolise the freedom, mischief and adventure of monkeys. 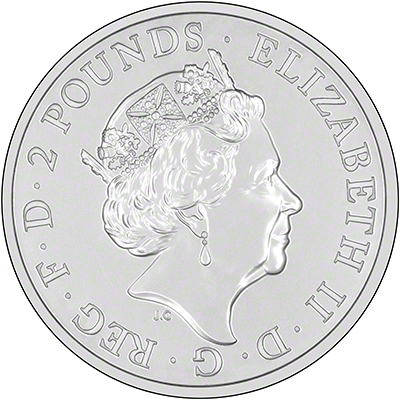 The obverse shows the Jody Clark fifth portrait of Queen Elizabeth II. This is the first coin in the series to have the new portrait. We are not currently stocking the proof version. If we get a large volume of enquiries regarding it, we may look into stocking some. Available in half ounce, one ounce, two ounce, five ounce, ten ounce and one kilo sizes.